Blog home»Do antimicrobial growth promoters really improve performance, or just improve health? Do antimicrobial growth promoters really improve performance, or just improve health? This article written by Dr. Reynold Bergen, BCRC Science Director, originally appeared in the May 2015 issue of Canadian Cattlemen magazine and is reprinted on the BCRC Blog with permission of the publisher. Ionophores (Rumensin, Bovatec, Posistac) are not medically important because the ionophores approved for use in cattle are not used in human medicine. Other antimicrobials used in livestock are medically important. Concerns around antimicrobial resistance in both human and veterinary medicine have led to increased scrutiny regarding how medically important antimicrobials are used in livestock production. In response, pharmaceutical companies throughout North America are removing production claims (i.e. growth and feed efficiency) from products containing medically important antimicrobials. Some of these products also have health claims, but four Canadian products only have production claims (two Aureo S-700G products, Chlor S-700, and Neo-Terramycin). These products may disappear unless the companies pursue new health-related label claims. Weed control is an important aspect in forage and cattle production as it affects forage yield and quality. Weed management can be accomplished through cultural, mechanical, chemical and biological controls. A more effective and sustainable weed management program should integrate two or more of these methods and consider long-term impacts. Over 95% of the weed control in a healthy forage crop comes from the competition provided by the existing forage stand. In 2009, a survey that focused on weeds was conducted of common irrigated crops including annual cereals (spring wheat, barley, corn), annual broad-leaved crops (canola, sugar beets, dry beans, potatoes) and perennial crops (alfalfa, grass hay) in Alberta. 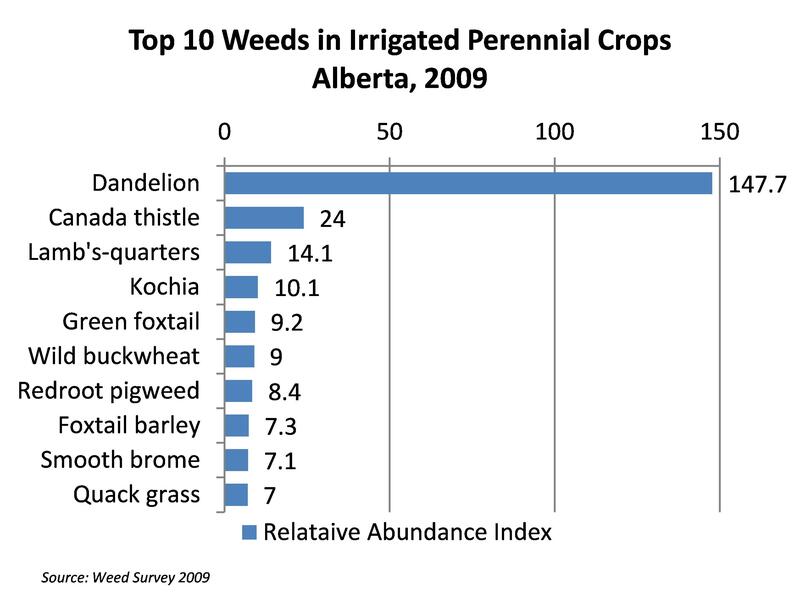 For the 135 fields of irrigated perennial crops, the top 10 most abundant weeds were reported as: Dandelion, Canada thistle, Lamb’s-quarters, Kochia, Green foxtail, Wild buckwheat, Redroot pigweed, Foxtail barley, Smooth brome, and Quack grass. The Alberta Beef Producers (ABP) and the Alberta Livestock and Meat Agency (ALMA) are now accepting letters of intent (LOIs) for research and development in areas that address targeted industry priorities. This article written by Andrea Brocklebank, BCRC Executive Director, originally appeared in the April 2015 issue of Saskatchewan Cattlemen’s Connection magazine and is reprinted on the BCRC Blog with permission of the publisher. Producer check-offs and private investments are critical to maintaining strong research expertise, facilities, projects and technology transfer in Saskatchewan. “Telling the future by looking at the past….is like driving a car by looking in the rear-view mirror” – Herb Bordy…but history helps illuminate the present. Shortly after Confederation, agriculture became a nation-building tool to settle the West and prevent U.S. expansion. Agriculture provided freight for Canada’s railroads, fed the urban population, and supplied millers, processors and exporters. Canada’s Experimental Farms Stations Act of 1886 supported productivity-boosting research and provided even more freight, food, and economic spin-offs.